You may once have thought that a vehicle's grille was just another piece of trim - but the truth is that it's an integral part of the visual appeal of the front of your vehicle. That means, naturally, that when you invest in a grille you'll want one which is going to suit your vehicle and be of the highest possible quality. 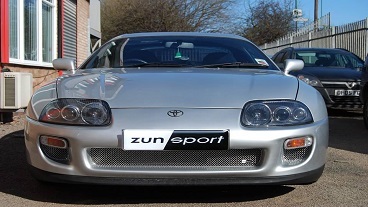 If you want quality custom grilles designed specifically for your vehicle, all you need is to get in touch with the specialists at Zunsport today. There are so many options available from stainless steel car grilles, to chrome car grilles, and even woven mesh car grilles - why should the touch of a craftsman matter so much? When you buy a bespoke Zunsport grille, you're buying something truly unique. There's no "one size fits all" approach to our grilles. Factory parts can often be ill-fitting, poorly finished, and sometimes just plain badly manufactured. Getting a bespoke part made by the specialists at Zunsport ensures that the final piece will fit your vehicle to perfection. We don't work from general measurements - we work off the exact make and model of your vehicle. This allows us to ensure the final product actually looks like it was made to measure - because it was! All of our custom grilles are developed with our unique prototyping methods. And it makes a difference. When you see a grille that's badly fitting or poorly finished, it seriously spoils the visual appeal of the whole vehicle. A specially designed and manufactured grille from Zunsport will do the opposite - it will make the front of the vehicle truly stand out. The quality and manufacturing expertise that goes into the development of every Zunsport grille makes them a considerable cut above factory stock. When you deal with a team who goes the extra mile for quality, like the specialist team at Zunsport, you can also be assured peace of mind throughout the whole buying process. Zunsport has a dedicated helpline to handle any questions or queries whenever they arise. The right help and guidance can make sure you're choosing the right material for the look you want to achieve. You have the benefit of years' worth of experience with every member of the Zunsport specialist team. Get in touch today to find out more.